Poker Accessories: Our Poker Accessories Include: Poker Chip Slot Frames, Poker Chip Drop Boxes, and More! Choose from our wide variety of Poker Table Accessories, all available for immediate shipment. 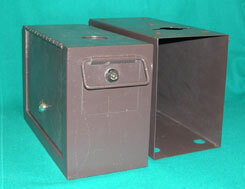 We carry poker poker drop slides, poker chip slot frames, poker drop boxes and more. For our FREE 104 Page Casino & Game Room Supplies Catalog, please contact us at 1-800-233-0828. Protect your chips and tips throughout the casino night with this Plastic Poker Drop Slide. 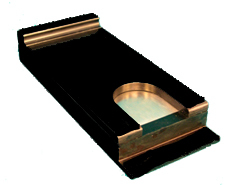 This drop slide has two 1/2" pieces of acrylic with a stainless steel spring loaded trap door. Our Poker Drop Slide has four holes, two on each side, for you to solidly screw down to your gaming table. These drop slides have an opening under the slide at 1-3/4" in diameter. The rest of the slide is 3-3/4" wide by 6-1/2" long and 1" tall. These all steel Poker Drop Slides are heavy duty for long term use. 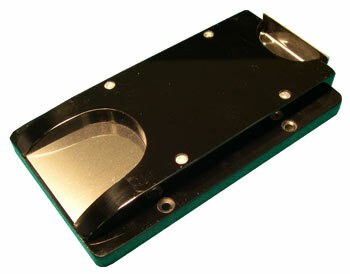 Our Steel Poker Drop Slide has a 1/2" bottom steel and a 1/4" all steel top with a spring loaded trap door. This Drop Slide has four hidden screw holes, for a professional clean look on your gaming table. 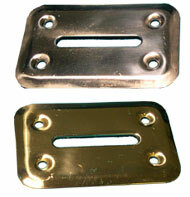 These drop slides have an opening under the slide at 1-1/2" in diameter. The rest of the slide is 3-1/2" wide by 8-1/2" long and 1-1/4" tall.